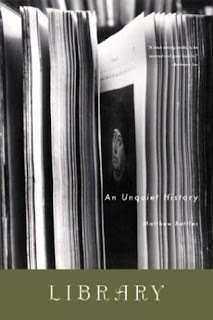 Library: An Unquiet History is a short, compact volume on the history of libraries throughout the ages. At the time the book was published, author Matthew Battles worked for Houghton Library and the rare-books library at Harvard. Library begins with an engaging introduction that will appeal to book lovers and provides an insider's look at Harvard University's library. Battles describes his experience with the Widener Library by quoting Thomas Wolfe, "the more he read, the less he seemed to know," on the subject of wanting to read everything in the library. Battles follows a timeline of library history dating back to Alexandria in A.D. 641 and walking us through the ages up to book burning by the Nazis during World War II. We are also given a background of Dewey-decimal system creator Melville Dewey and why the cataloguing process in libraries came about. The first chapter of Library called "Reading the Library" is the best portion of the book because Battles' language style and word choice will draw you in immediately. "Reading the Library" also shines because we can feel Battles' love for books emanating and radiating itself from the pages. I find it hard to engage into Library thereafter because the style and tone becomes droning and very dry. I definitely recommend Library to librarians, but it may not appeal to general book lovers despite the fact. I am quite sad that the rest of Library does not follow suit after the first wonderful chapter! 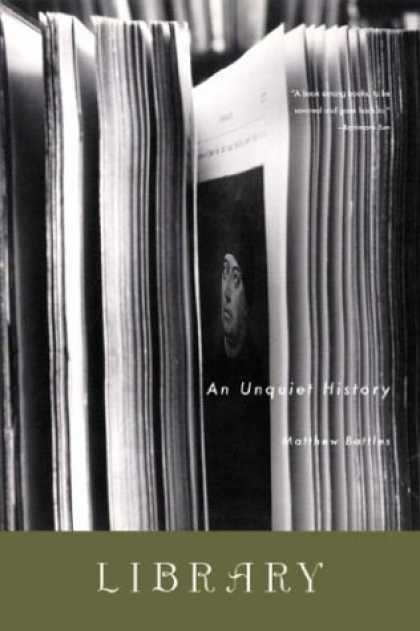 Matthew Battles has also written Widener: Biography of a Library , which I think I may have found more interesting than Library: An Unquiet History , since it revolves around the legacy that is Harvard.